Use on any computer with Adobe Acrobat Reader. Each of these books contains information you won’t find anywhere else in a convenient, user-friendly format. As you work through the lessons in the book, you will find an embedded video every few pages – all you need to do is click to watch the video. No searching through online videos and no balancing a printed book on your lap. Note: if you access these books on an iPad the video content will not play without certain apps installed. More info about iPad use at this link.
. . . teaches the fundamentals of 3D modeling using basic geometric shapes. Includes a 40-page guide to the most commonly used tools in SketchUp. Available as a download or on disc. 260 pages with 50 embedded videos. teaches woodworkers of all experience levels how to use 3D modeling to plan, design and problem solve. This is a new revision of the original book published in 2010. Don’t be confused by imitator’s books or videos with similar sounding names. 222 pages with 51 embedded videos. teaches the step-by-step process of designing a custom kitchen while teaching you how to 3D model using SketchUp. This book begins with laying out the room and shows how to find models online of appliances and cabinets in addition to your own custom models. It also details how to create a realistic presentation with life-like materials. 195 pages with 49 embedded videos. 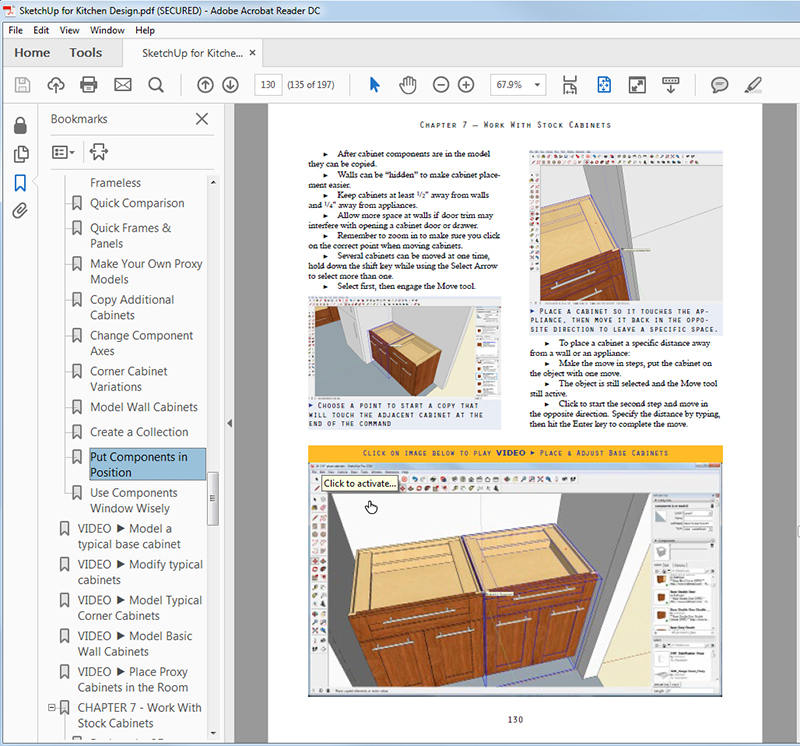 New Woodworker’s Guide to SketchUp Revised and Updated. Special Price on “Building Blocks” for “Woodworker’s Guide” & “Kitchen Design” Buyers. Woodworkers Guide to SketchUp-What About SketchUp 8?